I visit my brother who is staying in Cochin frequently and it gives me an opportunity in exploring interesting places around Cochin. Recently I was in Cochin on the way to Velankanni and we had a full day to spend. 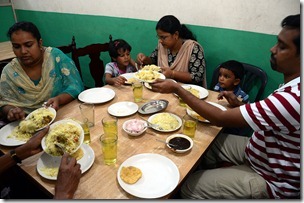 My brother suggested a trip to Mattancherry Jew Town and then a biriyani lunch at Kayees Hotel. 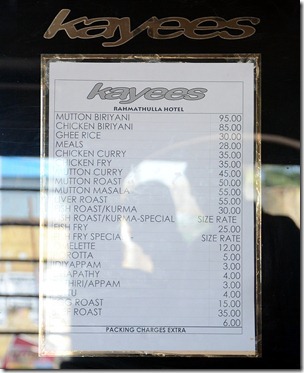 I had never heard about Kayees restaurant (or Kayikkante Biriyani). However after a quick internet search, I realized it is a highly hyped hotel famous for its signature biriyani (see additional resources below). The actual name of the hotel is Kayees Rahmathulla hotel and the signature biriyani they serve is known as Kayikkante biriyani. V.K. Kayee, popularly known as Kayikka (Brother Kayee) started his career as a cook and waiter in British army in 1940s. Later he started working as a waiter in Bombay hotel, Cochin. 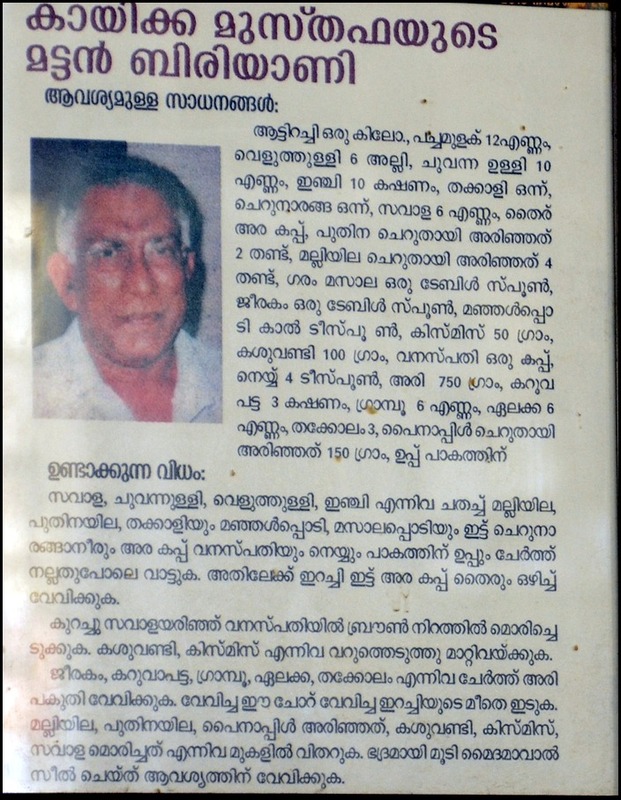 In the year 1948 he started a tea stall in Mattancherry. He converted it into a proper restaurant by the name Kayees Rahmathulla hotel in 1951. Since Kayikka’s death in 1999, it is run by kayee’s son Mustafa and grandson Shabeer. Currently Rahmathulla Kayees hotel operate in two locations – the original hotel in Mattancherry and a new hotel near Durbar Hall Ground, Ernakulam. Kayees Rahmathulla hotel also has a catering service (Kayees) which seems to be very popular. For example, people like P.K. 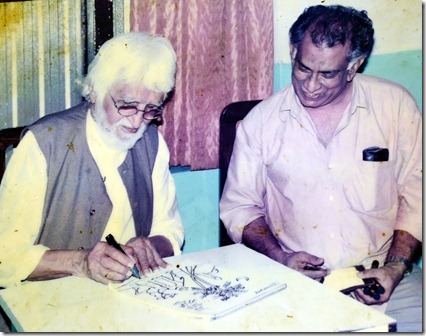 Kunjalikkutty, Philip Mathew, Mammen Mathew (Malayala Manora) etc. 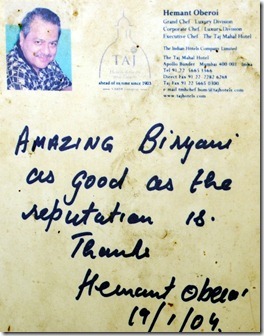 have written appreciation letters on the excellent catering service provided. We only knew that the hotel was located somewhere near Mattancherry and we asked a group of guys near Willingdon island about "Kayees hotel". They replied that probably we are looking for the famous "Kayikkante Biriyani" and gave precise instructions to its location! After talking to a couple of guys along the way, I realized that everyone knows about the hotel. 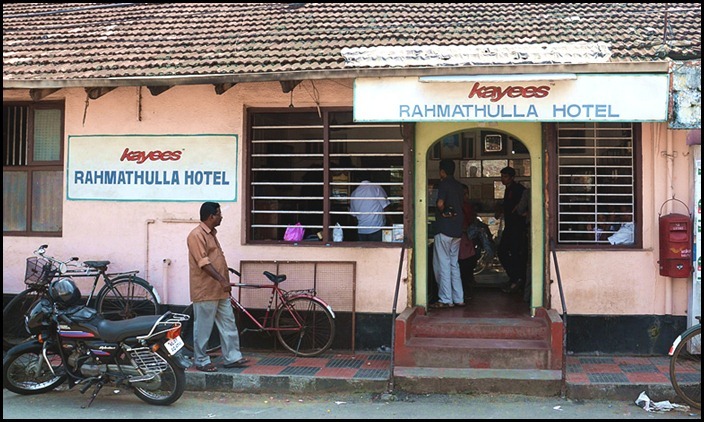 Kayees Rahmathulla hotel is located in Mattancherry. It is located on the northern side under 1KM from Fort Kochi ferry station and about 1KM from Mattancherry palace and Jew town. Click on the map to see the route to the hotel from Marine drive. 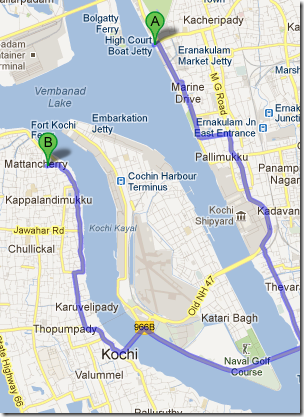 Another option is to take a boat to Fort Kochi. We had reached the hotel around 1PM and it was very crowded. The guy at the hotel instructed us to sit on the veranda and wait for our turn. 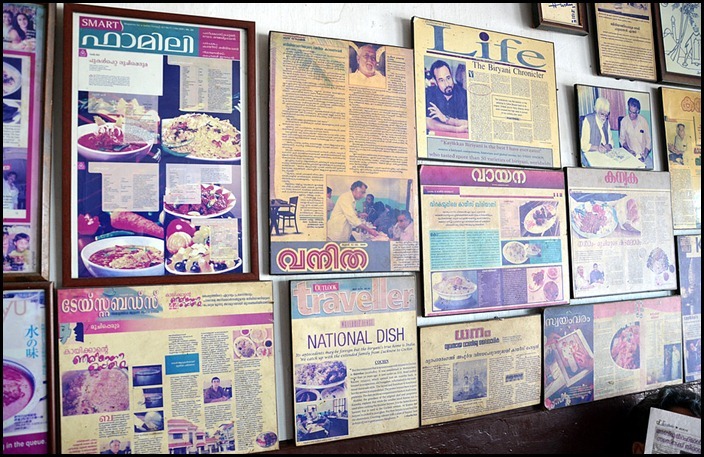 The waiting area is full of newspaper and magazine clippings about "Kayikkante Biriyani". There is a huge fan list on the notice board including celebrities such as Mammootty, M.F. Hussain, Kunchakko Boban etc. There was heavy rush, yet they managed the rush somehow. We had to wait for around 20 minutes since we went as a group of 7 people. We wanted to taste mutton biriyani, but it was not available and was a major disappointment. The next best thing in the menu was Chicken biriyani and we ordered it. It was promptly served with dates chutney, onion salad and pappad. The biriyani rice was crisp and delicious and the chicken was tender, gravy was spicy. However the biriyani didn’t have the special ingredients they usually show in the TV programs (cashew etc.). The portions was average and hence may not sufficient if you are going there with a big appetite. We asked for refill of the pappad and they promptly refilled pappad and onion salad. The service was good considering the rush. Usually after a heavy meal of biriyani, you feel drowsy and you feel guilty for a heavy meal. However we felt very light and relaxed after our indulgence. I guess this is the effect of using only natural ingredients. Other than this, I didn’t find anything special with the biriyani. I am pretty sure that if I went as a press/TV/celebrity guy, I would have been tasting a much better biriyani. For the usual customers, it is average biriyani at affordable price. If you visit Mattancherry, I recommend trying out the biriyani for lunch. I think the secret behind the success of Kayees is the consistency of quality and taste maintained over years. The recipe for the Kayikkante mutton biriyaani is mentioned in the following videos and the Yathra article. The following recipe is a translation of the dhum mutton biriyaani recipe I found in the hotel (see picture below). Crush onion, garlic, pearl onion and ginger. Mix it with coriander leaves, mint leaves, tomato, turmeric, garam masala, lemon juice, 1/2 cup vanaspati cooking oil, ghee and salt. Saute the mix. Then add mutton and 1/2 cup curd and cook the mix. Slice onions and fry in Vanaspati till they turn brown. Fry raisins and cashew nuts separately. Also half cook the rice with cumin, cinnamon, clove, cardamom and star anise. Add this rice on top of the cooked mutton. Then add the coriander leaves, mint leaves, pineapple small slices, cashew nuts, raisins and fried onion slices on the top. Seal the lid on the top of the cooking vessel with maida dough(all purpose flour dough) and cook. The delicious Kayikkante dhum biriyaani is ready! You have conveyed a lot of info in such short writings!